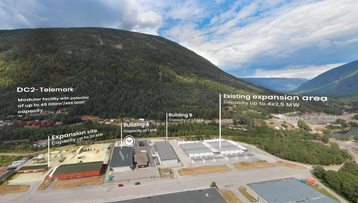 Norway's Green Mountain has acquired 140,000 square feet of land next to its data center in Rjukan, gaining the ability to expand the capacity of its campus by 65 percent. The data center operator owns two facilities: one in Stavanger (DC1-Stavanger), with up to 26MW of power supply in a Tier III configuration, set in a former NATO arms storage bunker, and another in Rjukan (DC2-Telemark), with up to 35MW of power supply. Both facilities are Tier III certified, run on hydroelectric power and rely on surrounding mountain water - or in the case of Stavanger, sub-glacial fjord water - for cooling. Last month, Green Mountain announced that it would be adding 35MW of power capacity across both sites, using Schneider Electric's pre-fabricated modules, on which the company spent €31.5 million. According to Svein Atle Hagaseth, the company's chief sales officer, the local abundance of affordable renewable energy gives Green Mountain "a big competitive advantage, especially as power availability is starting to be a limiting factor in some of the larger European data center hubs." Thanks to the new site, he told DCD, the company has the potential to install an additional eight data center modules at the Rjukan site, totaling between 15 and 20MW of capacity. This will allow Green Mountain to attract more cloud and HPC customers, as well as businesses seeking secondary facilities for disaster recovery purposes.